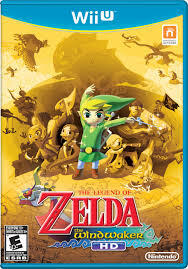 I played and thoroughly enjoyed the Wind Waker when it came out for the Gamecube years ago. I recalled it being like playing a cartoon at the time. It was pretty great. So when I saw it was being re-release for the Wii U I was certain to pick up a copy. The re-release was even finer than I recalled my previous experience when I played it before. It was really awesome and one of the finest games I’ve ever played. As a grown man, I really shouldn’t get that into a video game, but I was thoroughly hooked. I’d constantly find ways to squeeze in a few minutes here and there, searching for just one more treasure, etc. Addictive at times, but much fun. The cel-shaded graphics really held up well over time and in HD they were amazing. Everything was so bright and the artistic style was truly impressive. I know some fools thought it was too kiddish with the art style, but I’m still impressed by it. It’s incredibly well done. I thoroughly enjoyed this game a great deal and at times was almost consumed by it. It was that good. A fine reason to own a Wii U.